When we talk about noise in architecture, it is usually about its eradication. We install acoustic panels to absorb noise, partition rooms to prevent noise leakage and we plug in our earphones to block out irritating colleagues. However, there is another option to manage noise in architecture and it involves adding sound, rather than taking it away. Sound masking is the introduction of ambient sound to a space to mask disruptive environmental noise. It is a growing industry within interior acoustics that has been shown to effectively mask distractive noises and increase privacy, productivity and well-being for room users. This guide is designed to answer most of the questions about sound masking. Use the menu below to jump to the section of the guide that is most useful for you. Or look at the most frequently asked questions or the resources section to give you quick answers to your questions. If you are looking for a sound masking solution for your space, take a look at our sound masking products, or get in contact to discuss your project. How does sound masking help offices? Evidence for sound masking effect in offices. What are the sound masking components? How to setup in the office. Firstly, the sound must be random, meaning that it has no context and doesn’t transmit any information to the human ear. Whereas chirping and tweeting would convey the idea of birds to the human ear, sound masking conveys no meaning. Secondly, the sound is broadband (or wideband), which means the sound exists across a wide range of the audible spectrum (20 – 20,000 Hz). Sound masking VS white noise. What’s the difference? Sound masking is often incorrectly referred to as white noise. While they are both random signals of different frequencies, the sound masking spectrum is shaped around the frequencies of human speech. This is how speech privacy is created by sound masking. White noise, on the other hand, is unshaped, representing the full spectrum of frequencies. Furthermore, a correctly calibrated sound masking environment disperses sound throughout a given space, providing a consistent and dynamic sound environment. White noise, conversely, is localised and source-dependent. In other words, you can locate where the white noise is coming from, something you can’t do with sound masking. The growth of employee health, well-being and productivity as a consideration central to workplace design. A departure from partitioned, softly-furnished offices to open-plan, sleek and minimalist ones. Unfortunately, open-plan, minimalist design often jeopardises worker satisfaction and productivity. Hard, reverberant surfaces such as glass and concrete – both prevalant in modern offices – propogate and reflect, rather than absorb, noise. Sound masking is an effective way to tackle this problem. Sound masking allows spaces to retain the slick, minimalist design that dominates modern office spaces, whilst creating a soundscape that allows for fewer disturbances and aids worker productivity and happiness. Across open plan and cubicled offices the biggest complaint from workers is the lack of speech privacy. Speech privacy is the ability of an unintended individual to hear the contents of your speech. A lack of speech privacy means an increased ability for the content of your speech to be unintentionally heard by those around you. Say speech privacy is their biggest concern. Say visual privacy is their biggest concern. Say excessive noise is their biggest concern. The experience of the office worker attests to Treasure’s point, as this study from The Avanta Serviced Office Group shows. So we have established that office workers dislike noise and poor speech privacy more than any other workplace annoyance. But what are the consequences of this? The answer is both well-being and productivity. Noise, whether speech or otherwise, has subtle but profound effects on workers psycholigically, behaviourally and cognitivally. This study in the British Journal of Psychology found that “both speech and office noise can disrupt performance on memory for prose and mental arithmetic tasks”. An experimental laboratory study from ICBEN found that memory and complex cognitive functions suffered in environments with poor speech privacy. A Cornell University experiment that measured worker cognition in varying office conditions found that workers in noisy offices “made 40% fewer attempts to solve an unsolveable puzzle” compared to their counterparts in quieter offices. More recently, a study commissioned by Plantronics found that a mere 1% of employees (down from 20 per cent in 2015) “say they are able to block out distractions and concentrate without taking extra steps in the office”. Whether completing routine tasks, multi-tasking or conducting complex cognitive processes, excessive noise in the workplace is a productivity killer. Despite compelling evidence, and the fact that 96% of executives see productivity as “critical” to financial success, 63% of employees say they lack a quiet space to conduct focused work. It’s not just productivity that is harmed by excessive noise in the offce, it is also the health and well-being of workers. Research has shown that even intermittent exposure to loud noises can lead to higher long term stress hormone levels and hypertension. A study published in The Journal of Applied Psychology found that workers exposed to prolonged noises typically found in open plan offices were less likely to make postural adjustments and were more susceptible to slumping at their workstations – risking musculoskeletal disorders. It is clear that poor speech privacy can negatively affect our productivity, but even run-of-the-mill office noises that may seem innocuous, when prolonged and exposed to workers throughout the day, can harm us psychologically and physically. Old style offices with cubicles and partitions have been replaced wholesale by open-flow workplaces where collaboration is encouraged through face-to-face engagement and a greater sense of proximity to colleagues. Intuitively, this seems like a worthwhile trend, but experientially we simply don’t enjoy this way of working. One study found that a switch to an open-place office actually led to a 56% increase in email, rather than interpersonal, communication between employees. The study, by Bernstein and Turban, found that overall employees spent 72% less time having face-to-face interactions with each other in the open-plan office. A survey from William Belk found that 58% of “high performance employees say they need more private spaces for problem solving”. However, despite all our gripes about the burdens of open-plan office, it doesn’t look like the trend is going anywhere- in 2017 in the United States over 70% of offices had low or no-partitions. The idea is expounded by some of the world’s largest companies – Facebook’s main workspace is 10 acres of open office. Much of Apple’s $5-billion spaceship is built around the trend. That’s the bad news. The good news is that sound masking is a perfect solution to this dilemma. Sound masking is a proven and cost-effective way for offices to retain their open-plan, aesthetic designs while reducing the radius of distraction that employees face in open work spaces. Sound masking is an effective, cost-efficient solution to solve the biggest complaint of the modern office worker – speech privacy. Adding unobtrusive sound into an office reduces the intelligibility of human speech and facilitates greater speech privacy and reduces distracting noises. Sound masking does not eradicate disruptive noises, but rather it ‘drowns’ obtrusive noises out. By shaping the sound masking sound to match the spectra of noise in a given office, the distractive noises are effectively masked. Doing this reduces the radius of distraction that workers are exposed to. Typically, sound masking reduces the radius of distraction to 15 feet, meaning conversations more than 15 feet away become unintelligibile. Improvement in ability to focus. This study from the journal of the European Acoustics Association compared five different sounds and their effects on worker performance in offices. It found that the use of “constant masking sounds”, such as running water, when compared with other sounds such as instrumental and vocal music, improved worker satisfaction and productivity. Another study from Sweden concluded that sound masking, when compared to the use of headphones to drown out background noises, has a positive correlation on worker memory recall tasks. An independent review from The Remington Group found that sound masking led to a : 48% improvement on the ability to focus, a 27% reduction in worker stress levels and a 10% improvement in errors and inaccuracies in work tasks. Masking Generator: The generator is the source of the random electrical signals. Spectrum Equaliser: The spectrum equaliser converts the electrical signals to be accessible by the human ear. Mixer: The signals are then passed onto a mixer, where the appropriate levels for the signals are set. Amplifiers: The mixer passes the signals onto the amplifiers, which increase the signals’ amplitude. Zone Controllers: The amplified signals are then passed either onto speakers or to special devices that control the transmission of the signals into user-defined zones within the building or space. Vibrators: The signals are passed onto a vibration exciter, which uses physical structures, such as plasterboard, to transmit the sound. Each space in an office has different acoustic needs. For instance, a busy open-plan space would require greater sound masking volume than a quieter enclosed private office. Sound masking systems tackles this problem using zoning control. Each ‘zone’ is treated as its own acoustic environment, which allows the user to control the level of sound masking to match the requirements of each space. The requirements of a space are also dictated by the surface finishes. For instance, a room with glass walls and a concrete ceiling will propogate noise and creater a louder environment than a room with absorbant carpet and curtains. This is what is called acoustic room response. 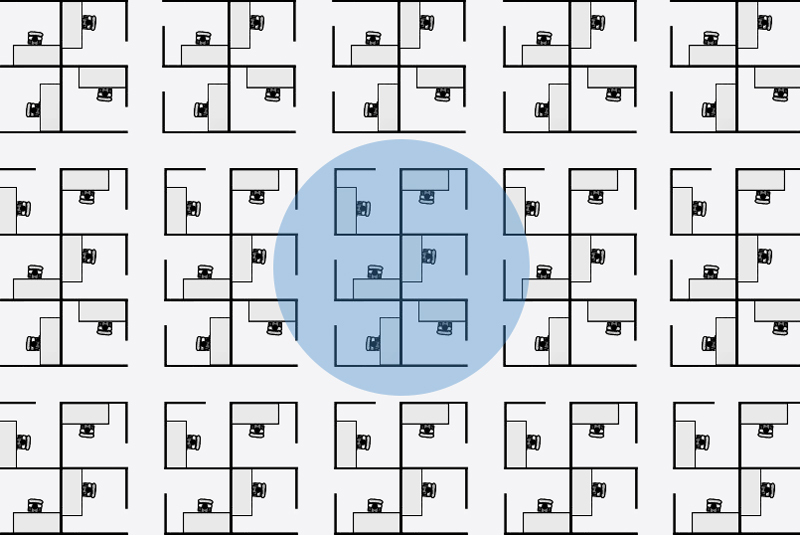 Zone spaces according to room function. For instance a meeting room and a lobby should not be in the same sound masking zone. Loudspeakers in the same zone should be of the same make and model to ensure correct frequency response. Each loudspeaker within a zone should have a similar acoustic room response to ensure effective sound masking. Distance = Height of deck + 2 ft.
To find a full list of calculations see Soft dB’s guide here. Sound masking is an evergrowing field in the world of architectural acoustics. Often lumped in with white noise, sound masking is a unique and effective way to reduce distractions in offices and other commercial environments. Unlike white noise, sound masking is the introduction of unobtrusive, broadband sounds, which are shaped to the human hearing spectrum. Sound masking effectively drowns out the most disruptive noises that affect focus, productivity, happiness and well-being of the users of architectural space. Sound masking is most commonly used in open plan officesOpen-plan offices are the most common spaces sound masking is used in. The advent of open, collaborative workspaces has inadvertantly led to an explosion of distractive noises that have invaded the spaces where we most need to concentrate and be productive. Estimates for the concentration crisis suggest we can be up to 66% less productive due to the popularity of open-plan office design. Fortunately, we don’t have to put back up the partitions; sound masking provides an effective acoustic solution to restore speech privacy and aid worker productivity. By ‘masking’ the most distractive noises, such as speech, sound masking can reduce the radius of distraction the average worker is exposed to. Additionally, sound masking may have therapeutic benefits for tinnitus sufferers and may help to improve sleep quality, particularly for in-patients in hospitals. The implementation of sound masking must include a number of considerations, including: zoning and room types, the type of speakers used, effective and accurate distribution of speakers to avoid ‘hot’ and ‘cold’ spots, correct implementation depending on ceiling type, among many more. If you are planning on your own sound masking projects then it is advised to use a professional to avoid incorrect configuration and ineffective sound masking environments. Sound masking: The use of random, broadband sound shaped to the human hearing spectrum to reduce distractive noise. Plenum: Another term for a ceiling void. The space between the top of a drop ceiling and the structural floor slab above. 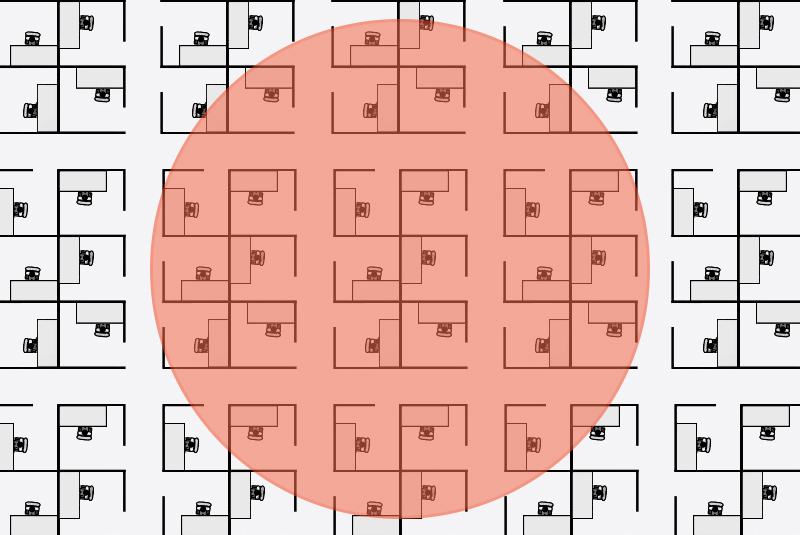 Sound privacy: The inability to understand conversational noise. Radius of distraction: Measured from the individual exposed to noise, it is the radius in which noise may distract the subject. Acoustic room response: How surface finishes in a given room affect the behaviour of sound, including sound masking sound. Masking Generator: The source of the random electrical signals. Zone Controllers: Devices that control the transmission of the signals into user-defined zones within the building or space. Vibration exciters: Devices which use physical structures, such as plasterboard, to transmit the sound. What is the definition of Sound Masking? Sound Masking is the addition of unobtrusive sound to an environment in order to ‘mask’ disruptive environmental noises, such as speech. Is Sound Masking just white noise? No, sound masking is shaped around the human hearing spectrum of 20 – 20,000Hz, whereas white noise isn’t shaped and represents the full spectrum of sound. Sound masking uses a number of devices to transmit and shape broadband, random sound into an environment, effectively ‘masking’ obtrusive environmental noise. Is sound masking suitable just for offices? Can I set up my own sound masking system? It is recommended that specialist sound masking engineers install sound masking system for the correct calibration and for optimal efficacy. How much does sound masking cost? Sound masking is a cost-efficient acoustic solution for commercial spaces. The main cost comes from the central unit, with the addition of speakers comparably having a lower cost. Small offices can expect to spend £2,000 upwards on a complete solution. Can I control the soud masking system? 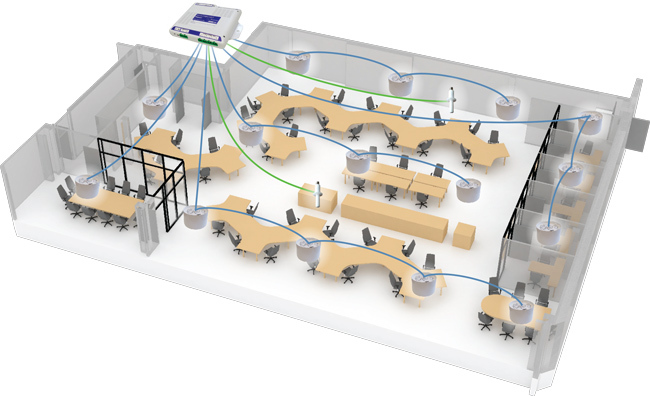 Operations and office managers can control the sound masking levels and output if they desire. Our sound masking systems use an automatic volume adjustment based on ambient noise levels, however should you wish to manually control the levels, then the systems also come with phone applications for user control. Does sound masking help tinnitus sufferers? The jury is still out on whether sound masking benefits tinnitus sufferers. Some studies, such as this one suggests that there could be some therapeutic benefit, particularly in those with ‘whistle-type tinnitus’. Other studies, like this one, suggest that the therapeautic benefits are less clear-cut. Can sound masking help productivity? Yes. One of the primary benefits of sound masking is to reduce the radius of distraction in work spaces. Sound masking can reduce the radius of distraction to around 15 feet, meaning colleague’s conversations can be less intrusive and disruptive. This is backed up by a number of scientific studies: here, here and here. Will I see the sound masking devices? Sound masking solutions can either be visible, or invisible, depending on your needs. Speakers can be mounted into plasterboard, or can sit above drop ceilings in the plenum. Control devices can too be hidden, or can sit in server rooms. Indirect sound masking is sound masking that is dispersed indirectly into a space, for instance sound that is first fired into a concrete ceiling and then reverberates back into the environment. This method can create ‘hot spots’ and sound may be uneven in places. Direct sound masking disperses sound directly into the environment, creating a uniform soundscape. Sound masking sound is designed to be unobtrusive. It sounds like mild, but warm, static. The sound isn’t displeasing and blends into the environment. Will I be able to hear the sound masking? If you focus hard, you can hear the sound masking sound. When you are engaged in a task, sound masking blends into the environment and you don’t notice it. Yes. A number of studies and surveys have shown that sound masking is a cost-effective and efficient way to reduce distraction and noise in commercial interiors. Why do I need sound masking? Offices and commercial interiors are becoming noisier and noisier. Open-plan offices and collaborative spaces have reduced our level of privacy, having real effects on productivity, happiness and well-being in the office. 66% of office workers believe sound privacy to be their biggest problem with their office. a 2014 study found that workers faced with conversational distractions lost 86 minutes a day due to distractions, with monetary consequences for businesses. Does sound masking help with sleep and insomnia? Some studies suggest that quality of sleep may be helped using sound masking devices, especially in healthcare environments, where environmental noise can disturb patients. This study measured a 42.7% improvment in sleep quality amongst hospital patients.